Learn more about our new Imaging Module Series! The new "Machine Vision Microscope" is a purely digital microscope with all the features that make a microscope. Read what is important and what you should consider when choosing your Imaging Module. We optimize and supplement microscopes in coordination with the respective manufacturer to enable new superstructures and inspection tasks. In our lens portfolio, you will find special lenses for integration into machines, versatile zoom lenses, powerful lenses with fixed focal length for different applications as well as telecentric lenses. Our mechanical components include several Tripod solutions and mounting options as well as a variety of Accessories such as, e.g. Measuring and traverse tables, focus drives and our Proven knee joint adapter. We have many years of experience in the manufacture and adaptation of accessories for microscopes of various manufacturers. All our analyzing systems are designed and manufactured by Opto. For specific tasks, we have developed these solutions with modern software. They can easily be adapted to a variety of possible applications. For the investigation of small particles and particles the Cleanalyser was developed. If a portable measuring microscope for on-site application, or two high-resolution magnifications in one device. We have it in the portfolio. The cost-effective high-speed vision system for the portable analysis of industrial processes in slow motion. "Plug and Play"
This innovative ‘under-bench’ design features integrated camera, high definition optics, LED ring light and optional software. Download our company and product brochures, as well as the data sheets for our standard products. Opto supplies customer-specific laser systems for laser fault inspection as excimer microscopes for ophthalmology and miniaturized metal microscopes. For machine manufacturers Opto develops and produces compact microscopy and laser systems in series. Opto already provides automated multifluorescence microscopes for cell analysis, autofocus inverse microscopes for motion analysis of growth processes as well as high throughput fluorescence microscopes for DNA and RNA sequencing. We have standardized measuring instruments for the inspection and analysis of roughness parameters as well as devices which supply standardized measuring protocols according to the usual standards of the residual pollution analysis. For many system integrators, we supply custom splitfield lenses, microscope objectives and coaxial lighting devices. Opto has been your reliable partner for sophisticated optomechanical solutions for 36 years. From prototypes to series production, we work with our market-leading customers to improve their solutions within their budgets until they are ready for the market. Our company philosophy can be divided into five strategic goals with which we prove our efficiency and competence. Opto UK is your partner for all microscope and machine vision requirements in the UK and Ireland. Opto is your software partner for your own system and machine software. We are based in France and have more than 20 years of experience in high-performance vision programming. Opto is represented in many countries in Europe, overseas and Asia directly, or through subsidiaries and dealers. In Gräfelfing you will find everything from a development, production and production to sales, all in one house. Opto has a global partner network for the components and systems divisions. With over 50 employees worldwide, we develop, manufacture and distribute high-tech solutions in Munich, Annecy, Lausanne, Liverpool and Hong Kong. News or newsletter, active or passive, take advantage of your favorite way to stay up to date. Where can you personally contact Opto? Events and fairs to which we are represented - a simple way to get in touch with us personally. We are always looking for creative and inventive people. People who not only solve problems but develop solutions. We have a long history in building and adapting equipment to Leica microscopes. From mechanical adpters to optical extensions, from protective equipment to add-on Functionality. We develop functional extensions ranging from purely mechanical solutions like stands and adapters to protective glass holders through to optical solutions like gap tubes, or our oblique and direct view modules. If you have a special requirement or application, simply contact us. We will do our best to help you. Three-dimensional objects often require a certain viewing angle to view critical details. With our ball tables objects can be easily turned and tilted. The foot-controlled vacuum fixation and the heavy granite plate ensure safe positioning. The entire system of granite plate, stable tripod and mount microscope combines to create a tilt-and ergonomic microscopy workstation. Its objects and the microscope can be aligned at a certain angle to each other and fixed. With the 32 mm column, it is optimally designed for a Leica-focus drives. We offer different lens adapter depending on the microscope. These adapters can be used for all microscopes that have an M50x1 thread. These adapters can be used for all microscopes that have an M65x1.5 thread. The two-axis image erection module ZAB displays the image in both axes side-correct in the eyepiece and on monitor. It is quickly and easily positioned between microscope and tube. Adapter to ring light Leica LED 5000 and compatible to stereo objectives with diameter 80 mm. from falling out at all inclined viewing angles, such as wall or inverted viewing. The Long working distance Objective M600 is especially designed for Leica stereo microscopes. Depending on the lens, you can extend your working distance up to 1200 mm. With the appropriate adapters, the M600 can also be used with the Leica M50, M60, M80 and DMS. An adapter for a ring light is also available. Dual-Camera Coupler optimized for VIS splitting ratio 50/50. • Sensor size: max. 1"
Other conditions are possible on request. If you need an enlarged working area, simply extend your M-Series column by 100 mm with our drive extension. With the Ringlight Adapter you can connect a Leica Dome LED 5000 HDI to lenses with a diameter of 58 mm. The Opto ScanStand enables high-precision, automated 3D stitching with Leica microscopes. The ScanStand consists of a high-precision motorized table and a Z-axis mounted on a high quality table. Depending on your requirements, ScanStand is available in various configurations. 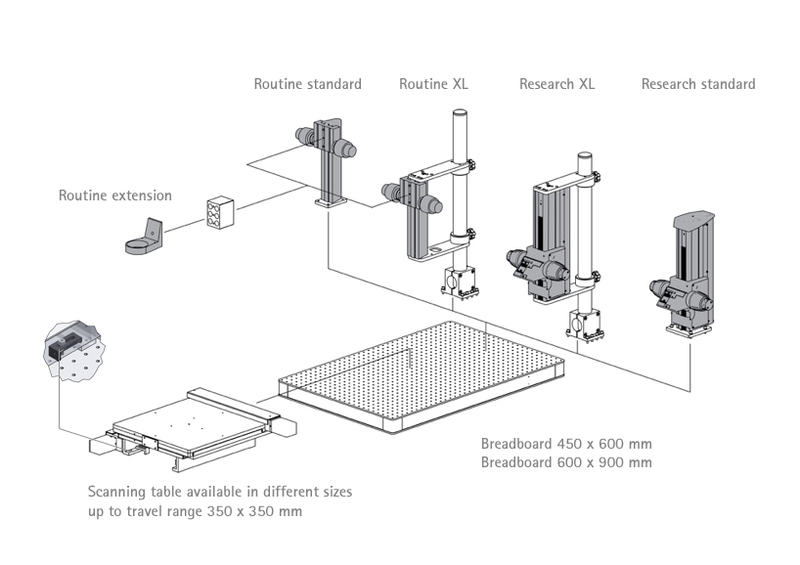 ScanStand is the interface to the Leica "Routine" + "Research" columns and is compatible with all Leica microscopes and a wide range of focusing drives is available to provide compatibility with a variety of scan sizes up to 350mm x 350mm. The Slider filter lets you switch between the neutral density filter and a free field that can be used for a second filter. This lens slider allows quick change of two different lenses. This allows you to quickly change two lenses with different focal lengths. You can expand very quickly and easily the magnification range of your microscope. The stable, yet compact design fits perfectly with any Leica microscope. The M60x1.0 thread fits the Leica microscopes M50 / M60 / M80, DMS 1000 and some Leica SOM microscopes. By using lens adapters, lenses of other series can also be adapted. Many stereo microscopy applications such as solder rework or bio sample processing can result in debris or unwanted contamination being deposited directly onto the objective lens. This can result in lengthy cleanup operations, or as a worst case, replacement of an objective lens due to excessive contamination. The Protection Glass Holder from Opto solves this problem by providing the option of securely placing a removable protective glass disc in front of the objective lens. A direct fit to the Leica LED3000 diffusor makes this easy to install, and simple to use. With an optional pack of 5 spare glasses, your customer is well prepared for every eventuality!